The day began as many have so far… with a quintessential Parisian breakfast. Still not tired of them yet. I was excited to be up and about again this morning. Because I was in Paris? Yes, but also because I keep seeing Star Wars posters up everywhere! Less than a week! He he. Anyway, so what did we actually get up to? 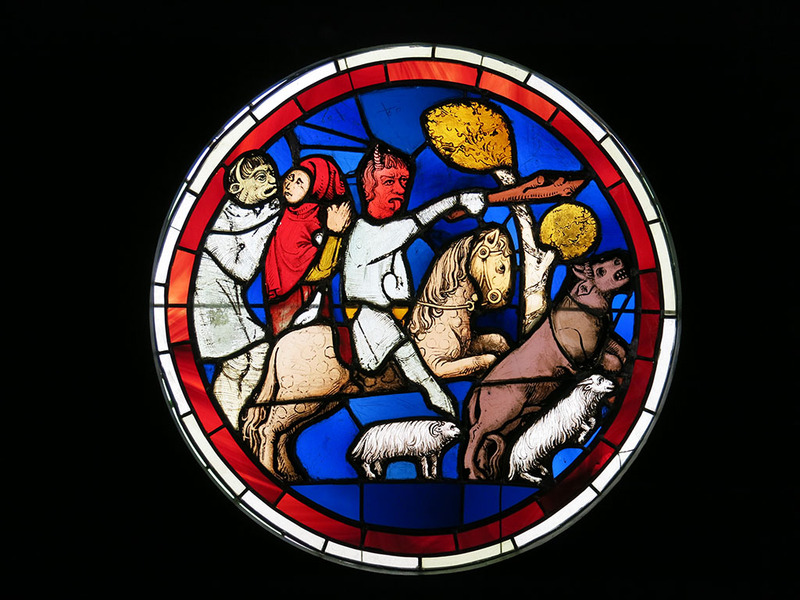 The day began in earnest with a visit to the Musee du Moyen Age (Museum of the Medieval Age) which was only 5 minutes away from our digs. In any other city this museum would be a must see, with its ancient locale (in the remains of old roman baths) and collection of medieval artefacts and tapestries. 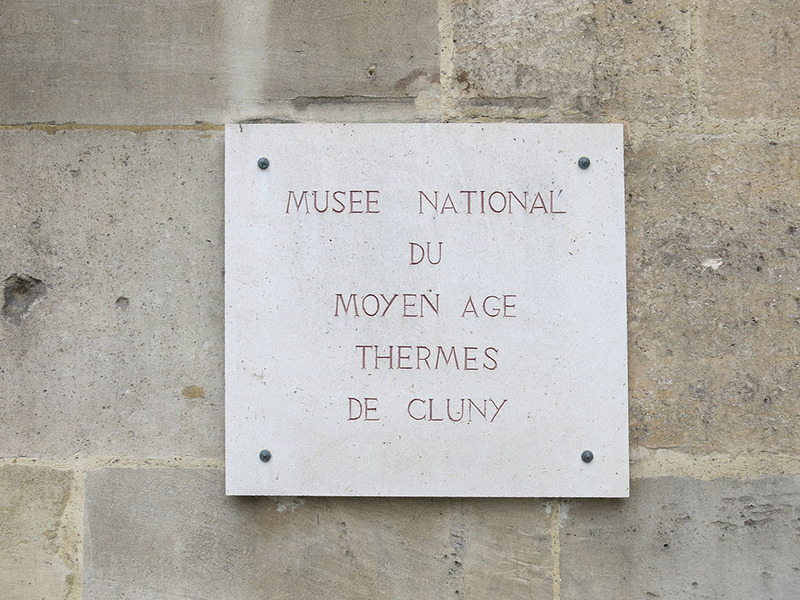 But in a place like Paris, this is probably one of the those museums you just don’t have time to visit because of everything else there is to see in the city. Kate was keen to see a particular set of tapestries there, so that was as good a reason as any. So just after opening in we popped. As mentioned, it is quite a modest museum compared with everything else the city has to offer. As a result we moved through quite quickly, checking out statues and stained glass that had been rescued from different places. 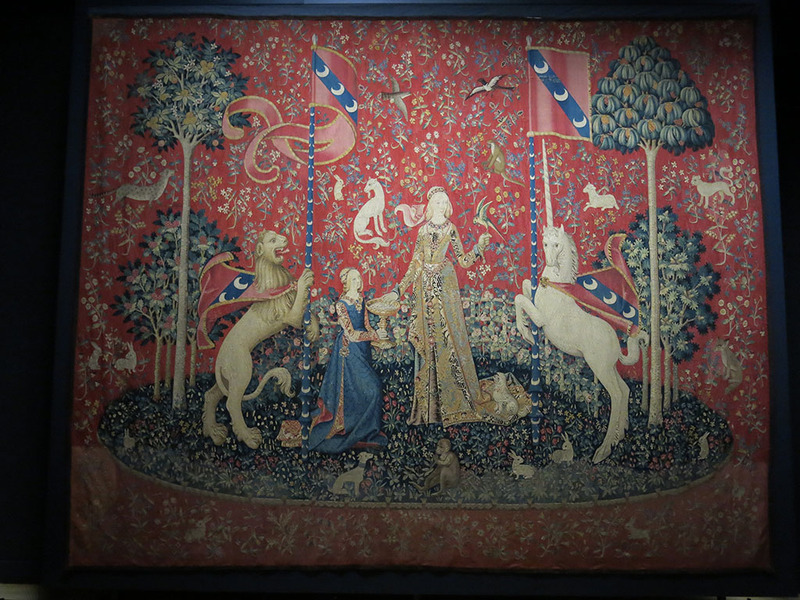 We then arrived in the room of the their main drawcard, the series of 6 tapestries known as the Lady and the Unicorn. Dating to the 15th century, their origins are a bit of a mystery. The symbolism behind them is the 5 senses, and 5 of the 6 represent them. The 6th ties them all together, with its full meaning still a bit unclear. The works are really quite amazing, and seeing them hung in the one room is quite powerful. Easily worth the time to visit, and probably a shame more people don’t get to see what is undoubtedly an amazing piece of art. 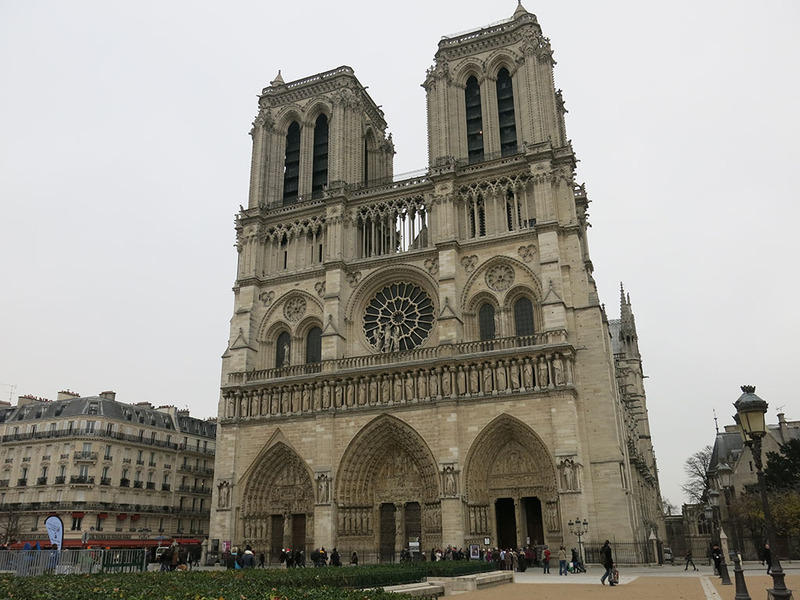 With that, we decided to keep wandering down Boulevard Saint-Michel to hit the Seine, and on to the small island that is home to Notre Dame. The weather had cleared a bit, so we decided now was as good a time as any to visit the gargoyles at the top. It is worth paying note again to the huge police and military presence there is around Paris. We were starting to see it even more, and here at Notre Dame was no exception. Constant armed forces wandered past, and we were being security checked into virtually every building we entered, even shopping centres and supermarkets. We weren’t sure if this had been the new norm for a little while or if recent events had put this into action, but sadly we were getting used to the constant security checks and balances. The queue to head to the top was quite short so up we went. I always get a kick out of seeing the gargoyles on top looking out over Paris. Sure it is a cliche, but it is things like these cliches that are part of what makes Paris so special. It was a bit cloudy so views weren’t spectacular, but still enough to gaze out far and wide. Back down the spiral staircase it was, and into Notre Dame proper. Kate had never actually been in, so it was cool to be with her for her first visit. We said hi to Joan, and move through fairly quickly. Given we have museum passes that run until Sunday, we were looking to visit all the things we were keen that were covered on it. So we decided it was time to rest, clear our minds, and enjoy some tranquility. The Musee de l’Orangerie is the place to go. 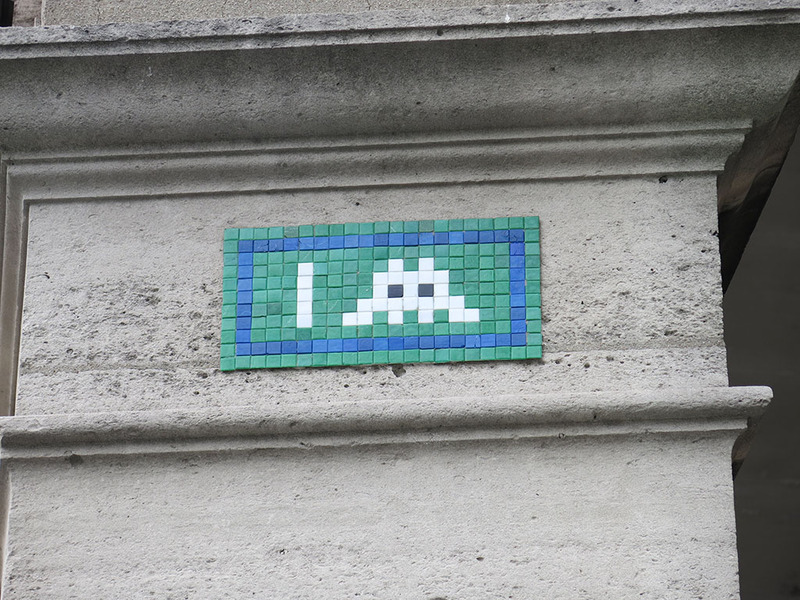 On our way I spied my first couple of Space Invaders perched up high. Score! I really need to be more vigilant as there are SO many around Invaders home town. In no time we arrived at the l’Orangerie. This museum is a small collection of impressionist and post-impressionist works, that are in tune with the d’Orsay in many respects. But the reason to come here is to enter into the first main rooms and just sit. I had not been here in a long time so had not had a chance to enjoy Monet’s Water Lilies as intended. After clearing your mind in an empty room, you wander in to two huge spaces and a surrounded by the beautiful greens and blues of the immense canvases that comprise Monet’s work. I had seen these canvases before, and much of the related work, but to sit in a stark room surrounded by them was amazing. So we sat. Soaking up the small details in the works. We could have sat their for hours really, enjoying from back and up close. And we did for quite a while before moving through the rest of the modest (in size) collection. Out we wandered back into the hub-bub of Paris. The day had turned quite lovely, so we thought we should go back to Musee Rodin to enjoy the sculpture garden that we missed previously. So much nicer wandering about in the fine weather… umbrellas don’t really help do the gardens justice! Speaking of cliches, I couldn’t help but get yet MORE photos of the statues and The Thinker in particular. With this, our day was winding up so we headed back to the hotel. I still had some energy, so I decided to make use of some late opening hours and head back out. Destination Louvre! Even though it was only a 20 minute walk from our hotel, it still pays to check you have the right museum when looking to visit late. Seems late nights at the Louvre are Wednesday and Friday, not Thursday as I thought. Seemed I got my wires crossed! Bah! That was OK, more time to enjoy the brisk streets of Paris and see some of the sights lit up. Venus could wait until tomorrow. P.S everyone… I am about a day behind in posts so will try my best to catch up!